Global Herbs Alphabute can be used as a fast acting soothing formula required for improving muscle and tendon comfort that are active or worked hard. This is a potent alternative to the use of products based on Devils claw. 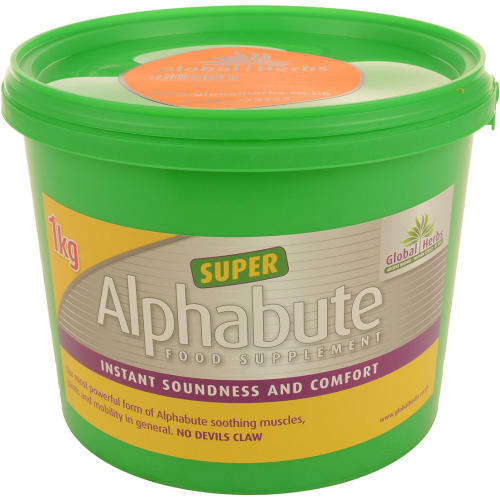 Alphabute provides nutritional aid within a few hours and boosts circulation to the areas that need a little more help and comfort. -	Feed whenever your horse is not feeling right and is restless. -	Feed after a fall or when travelling has been traumatic. -	Feed after hard exercise for easy recovery. -	Feed routinely after heavy work. 1- 3 10ml scoops twice daily/ 500kg horse.